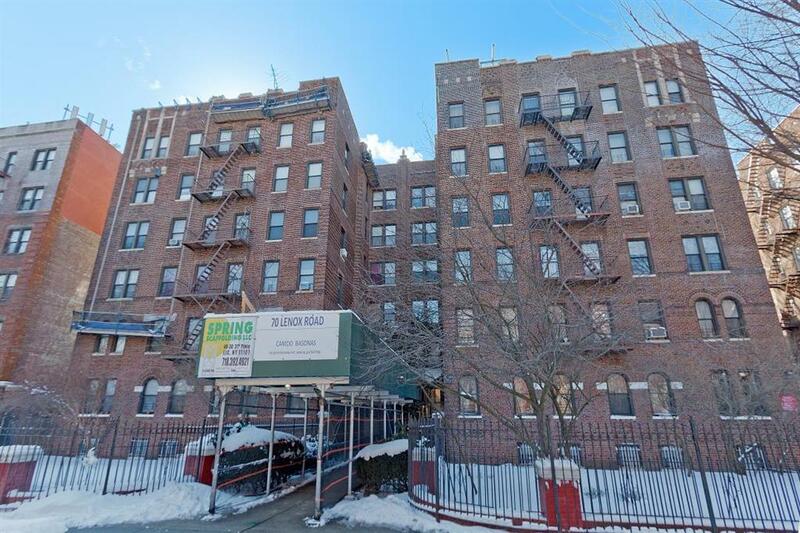 Feast your eyes on this Large 1 Bedroom Co-op Located in a Premier Lefferts Gardens Pre-War Building. This Apartment is approximately 1100 sq.ft and boasts original details with exceptionally maintained hardwood floors throughout, 10" foot ceilings, 1 Bathroom with a Bathtub and a Standing shower, an eat-in Kitchen with Updated Cherrywood Cabinets and Fixtures. The living room is large enough that the owners created a temporary second bedroom. The very large Bedroom gets filled with Natural light from its 3 full size windows. There are 3 huge closets in the main hallway which uses all 10 feet of the ceiling height in the apartment. The building has laundry facilities in basement as well as additional storage. There is one parking space available off-site for a monthly fee. The maintenance is only $739 monthly. Entering the lobby of this Majestic building will take you back to a time when Craftsmanship and Skilled Woodworkers were held in the highest regard with the original wood rafters being in impeccable condition. So don't let the opportunity to own this apartment and live in the most highly desirable neighborhood in Brooklyn pass you by. Call today to arrange a viewing.